There’s some new terrain in town, and if you’re an expert skier – listen up: Whale’s Tail and Peak 7 Bowl are now open! If you’re looking for some fun, double black diamond terrain, Whale’s Tale and Peak 7 Bowl are the place to be. If you’re anything like us, your New Year’s resolution may include exploring new terrain, or re-visiting some of your favorite Breck spots. You may want to include conquering these steeps on your resolutions list, if even just for good measure! There’s still more terrain openings on the way, so stay tuned as we announce even more. Whale’s Tale, just off the Peak 8 summit, features high alpine terrain and amazing views everywhere you look. And as you’re above tree line while making tracks in the Peak 7 Bowl, you’ll feel like you’re on the top of the world. Highs are in the 30s today with mostly sunny skies at Breckenridge ski resort – the perfect mix of conditions for a big day on the mountain. There’s over 2,200 skiable acres open, and with the new terrain openings at Whale’s Tail and Peak 7 bowls, there’s even more to explore. After your epic day on the mountain, celebrate the completion of your New Year’s resolution at T-Bar at the base of Peak 8. There’s no better way to end the day than at one of Breckenridge Ski Resort’s fun bars. Now that you’ve conquered these steeps, are you ready to take it to the next level? 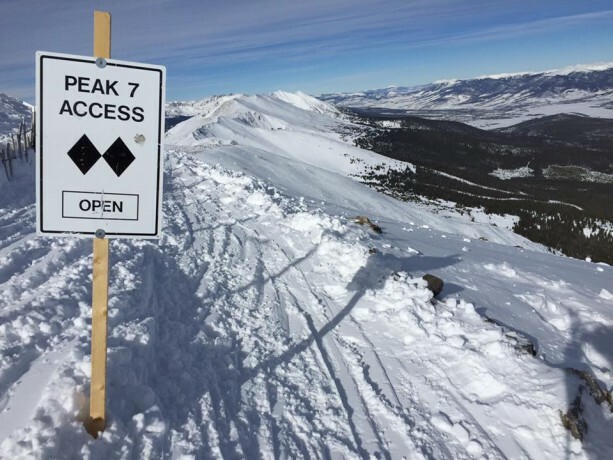 The Breck Guides program will teach you what you need to know about high alpine travel, avalanche awareness, and avalanche rescue. Your own personal guide will cater to your needs and leave you more confident in your mountain expeditions. It’s a great way to learn from the best of the best! With the new, high alpine openings, it is wise to be aware of natural objects in the snow and to always obey posted signs.